With over 25 years of experience in the glass industry right here in Arizona, NU-VIEW Glass has the knowledge and experience to provide you with the best quality workmanship you expect from a home window and glass replacement service. The experience you need to get the job done right. Call us today for a free quote at 623-215-7125! On time and on schedule is one of our key values, and when it comes to being there when we are expected to be, we deliver. We know your time is valuable, and we will not keep you waiting for the quality window glass repair service you deserve. From measurement and estimate to the finished job, NU-VIEW Glass offers the fastest turn around in the West Valley! 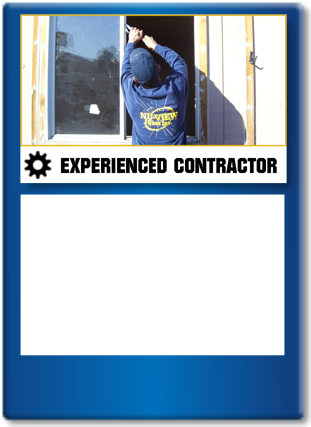 Always use a Licensed Contractor like NU-VIEW Glass for any window repairs, or improvements to your home. Licensed contractors are held to the strictest of State regulated standards and are accountable for their business ethics and service standards within the community. Protect yourself from poor workmanship and unskilled labor. 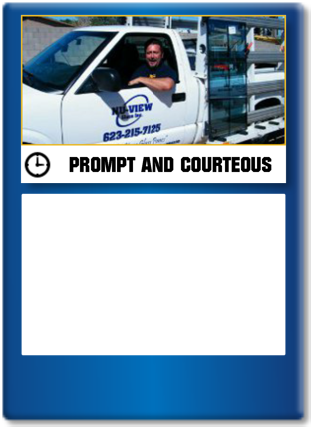 NU-VIEW Glass Inc. provides mobile repair and replacement services for all of your home window and glass needs in the metro Phoenix west valley. We are family owned and operated. We keep our overhead low and pass the savings on to our customers. Our goal is to exceed our customer's expectations so they will refer us to their family and friends. We can assist you with all of your home glass needs, including insulated glass, thermo pane glass, dual pane glass, single pane glass, tempered glass, safety glass, sliding glass doors, glass shelves, table top glass and more! Accredited member of the B.B.B., Licensed, Bonded and Insured: AZROC #254030. We are confident we can provide you with the ultimate in customer service and satisfaction! Free estimates! We are your "Home Glass Specialists!" When you call for service for window and glass repairs in your home, you need to know that you can call a service that you can trust. 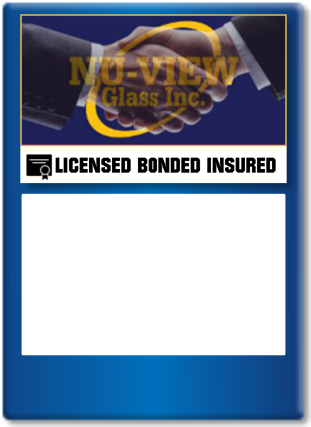 The owners of NU-VIEW Glass Inc. Have been providing quality, trusted and reliable glass repair and replacement service throughout the state of Arizona for over twenty-five years! Accredited member of the B.B.B., Licensed, Bonded and Insured: AZROC #254030. We are confident we can provide you with the ultimate in service, quality and satisfaction! Written warranties, Free estimates!